Castable frameworks for metal casting and castable layers for press ceramic. 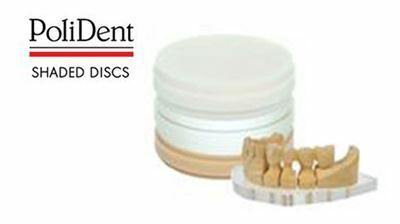 These high-quality PMMA discs are biocompatible for patients with allergies and have the highest density possible because there are no inorganic fillers or fibers. 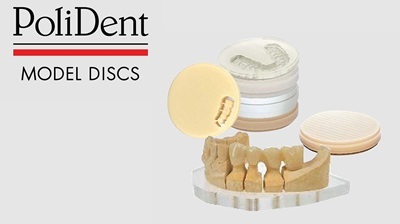 POLIDENT PMMA CAD-CAM DISCS are suitable for fabrication of temporary crowns and bridges and for verifying the restoration on the plaster model / in mouth before the final milling process. 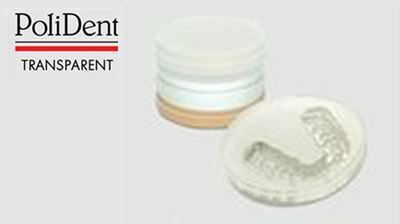 PMMA-poly methyl methacrylate is primarily designed for production of long or short term temporary restorations. Available in various shades, this material serves well for clinical as well as laboratory needs. Benefits: Strength and Stability, High Luster Polish-ability, Excellent Machinability, Absolute Bio-compatibility and Stain-able. Shades: A1, A2, A3, B1, B2, B3, BL1, BL2, BL3, CLEAR, enamel colours - E1, E2*. *Upon request we can supply also other shapes, diameters and designs. 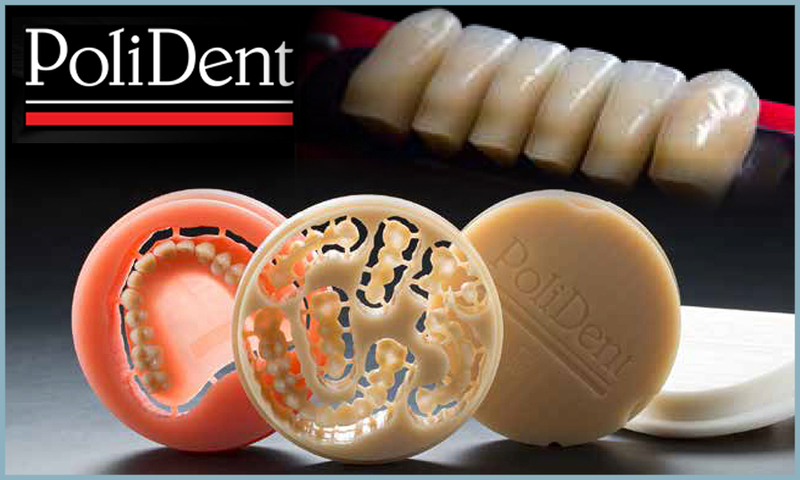 POLIDENT MULTILAYER PMMA CAD-CAM DISCS are ideal for obtaining a perfect color effect of temporary crowns and bridges in a single step. 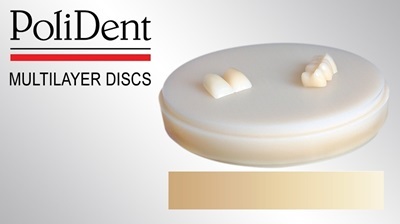 These multi-layered discs are produced with 5 gradient layers in colors of: enamel, dentin and cervical to provide a natural look. Benefits: Strength and Stability, High Luster Polish-ability, Excellent Machinability, Absolute Bio-compatibility. 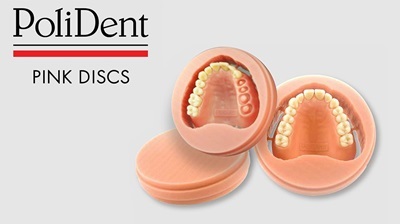 POLIDENT PINK PMMA CAD-CAM DISCS can be used to mill digitally designed highly esthetic and functional dentures. 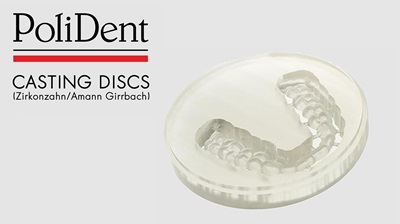 Discs could be used for immediate load implant denture as a long term provisional in combination with denture teeth and titanium connectors. 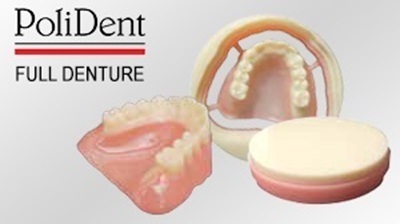 The denture bases and other structures are designed in CAD Software. A 5-Axis milling machine is required, to reach undercut areas. Artificial teeth are attached on denture base with PMMA resin or light curing composite material with proper primer. Diameter: 95 – 105 mm. Thickness: 25, 27 and 30mm. 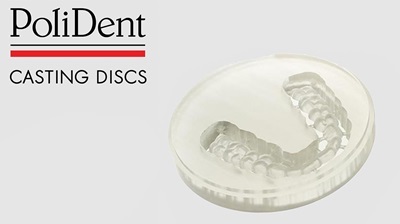 POLIDENT FULL DENTURE PMMA CAD-CAM DISCS can be used to mill digitally designed highly esthetic and functional full dentures. Teeth can be milled directly or used in conjunction with artificial teeth which are attached on denture base with PMMA resin or light curing composite material with proper primer. Diameter: 95 – 105 mm. Thickness: 30mm (denture base layer 18mm, dentin layer 12mm). Shades: Pink / dentin layer: A1, A2, A3. Other shades available upon request. 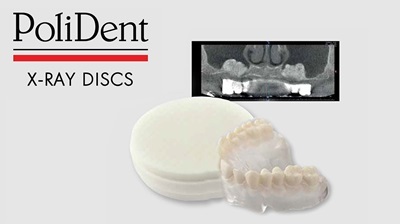 POLIDENT X-RAY CAD-CAM DISCS are X-ray visible discs used for milling diagnostic stents for implant planning. Contains X- ray visible powder. Homogeneous mix ensures best visibility. POLIDENT CASTING CAD-CAM DISCS are suitable for milling castable frameworks for metal casting and castable layers for press ceramic. Available in two densities A higher density (beige) is easily machinable with CNC milling machines and has an extremely high quality surface finish. With its tight cell structure is especially recommended for milling of stumps/dies. A lower density (brown) is easily machinable with CNC milling machines and is very light to handle. Recommended for bigger models and antagonist models.